The Nature Conservancy recently released the results of the first global survey that shows how much time kids spend outside and parents’ perspectives on the importance and benefits of time spent in nature. The results of this research are less than reassuring. The survey, funded by Disney, included parents of children between the ages of three and 18 in the U.S., Brazil, China, France and Hong Kong and revealed that 65% of U.S. parents think it’s a “very serious” problem that kids are not spending more time outdoors. This is actually equal to parent concerns about bullying, the quality of education and obesity. Yet, despite parental concern, kids are spending almost zero time outside. The study shows that time spent outdoors varies by age, and almost always declines as kids get older. Preschoolers spend about 12 hours a week outside and once a U.S. teen turns 16, they’re spending less than seven hours a week in nature. These U.S. trends ring true worldwide, with the exception of Brazil. And the study shows that in Hong Kong, for instance, teens spend as little as 1.8 hours per week outside. Stephanie Wear, a scientist for The Nature Conservancy says, “Most parents in each of the markets we surveyed say that they would like their children to spend more time outdoors than they currently do. This is really encouraging because it tells us that to parents, nature is not just ‘something to do’ but a crucial part of childhood.” However, for a nation of parents who claim to worry about outside time, some truly lame issues are keeping kids inside. The surveyed parents cite homework as the number one reason kids are inside so often, along with crime and gangs, and cuts in recess time as accessory reasons. Astoundingly, U.S. parents said something no other parents in the world said however: U.S. parents cited their child’s discomfort with being outdoors (too hot, rainy, the presence of bugs, etc.) as the second-biggest obstacle to getting outside. “The realization that there are kids who are growing up reluctant to go outside is a serious problem,” says Wear, who is also a mother of two. Agreed… although that’s putting it lightly. I’d simply say it’s time for parents to man up. Big time. Just to be brutally honest, I’m sick to death of parents who feel like life needs to be all cushioned with zero risks for their kids. Oh no, don’t make them try food they won’t like, solve all their little battles with friends for them, don’t make them walk 5 minutes to school and by all means, keep them inside where they’re safe from a little dirt or exertion. Life is uncomfortable at times. Get. Over. It. Already. Do you want your kid missing out on the above? No? Then it’s probably NOT going to harm them if you also make them go outside, even if it causes minor discomfort at first. “Parents are the gatekeepers to nature,” says Wear. “They have the power to foster a love of nature in their children – making them happier, healthier and smarter – just by going outside.” Well said! Life is messy and risky, but messes and risks make for some wonderful adventures and adventures are what make life worth living. Push your kids to learn this early on. Or don’t. Maybe, if you’re lucky, your kids will end up living with you forever, running every decision they ever make by you, just to be safe! Have fun with that. I totally agree. While we don't have a backyard we are luckily is a mild climate that allows us to be outside playing in creeks, playgrounds, bikerides etc. I really noticed a change when we got home from camping this past weekend. They played so much more independently even when they were inside. I think that having a lot of solid outdoor time with not much else to do does wonders for their imagination and appreciation. NOT however a big fan of your advice to "Man Up". Strength in parenting isn't relegated to men only. It's a little insulting, this is 2014. Thanks. Thanks for sharing your experience, TCody. The term "man up" was not at all intended to be gender specific here -- especially since the writer said "it's time for PARENTS (not dads, or men) to man up." We are in no way suggesting "strength in parenting" is limited to either gender or one gender specifically. A little boy sitting on a big rock pouting. 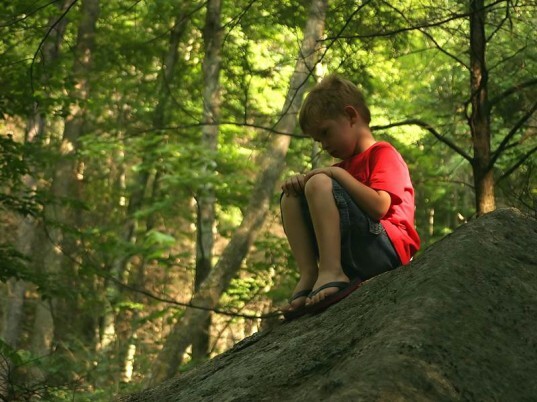 The Nature Conservancy recently released the results of the first global survey that shows how much time kids spend outside and parents� perspectives on the importance and benefits of time spent in nature. The results of this research are less than reassuring.�The survey, funded by Disney, included parents of children between the ages of three and 18 in the U.S., Brazil, China, France and Hong Kong and revealed that 65% of U.S. parents think it's a �very serious� problem that kids are not spending more time outdoors. This is actually equal to parent concerns about bullying, the quality of education and obesity. Yet, despite parental concern, kids are spending almost zero time outside. The study shows that time spent outdoors varies by age, and almost always declines as kids get older. Preschoolers spend about 12 hours a week outside and once a U.S. teen turns 16, they're spending less than seven hours a week in nature. These U.S. trends ring true worldwide, with the exception of Brazil. And the study shows that in Hong Kong, for instance, teens spend as little as 1.8 hours per week outside.